Production: Pioneer Films (RKO); Technicolor, 35mm; running time: 83 minutes (1943 reissue, 67 minutes). Released 13 June 1935; reissued in 1943 as Lady of Fortune ; restored at UCLA film archive and reissued in 1985. Cost: $400,000 (estimated). Producers: Kenneth MacGowan and Robert Edmond Jones; screenplay: Francis Edwards Faragoh, from the play by Landon Mitchell and the novel Vanity Fair (1847–48) by William Makepeace Thackeray; photography: Ray Rennahan; editor: Archie Marshek; production designer: Robert Edmond Jones; musical score: Roy Webb; choreographer: Russell Lewis. Richman ( General Tufts ); Doris Lloyd ( Duchess of Richmond ); Colin Tapley ( William Dobbin ). Awards: Best Picture (Rouben Mamoulian) and Best Color Film (Rouben Mamoulian and Ray Rennahan), Venice Film Festival, 1935. Cook, David A., A History of Narrative Film , New York, 1996. Spergel, Mark J, Reinventing Reality: The Art and Life of Rouben Mamoulian , Metuchen, New Jersey, 1993. Greene, Graham, "Review of Becky Sharp ; Barcarole ; and Public Hero No.1 ," in The Spectator (London), 19 July 1935. Mamoulian, Rouben, "Some Problems in the Direction of Color Pictures," in The International Photographer , 1935; reprinted in Richard Koszarski, editor, Hollywood Directors 1914–1940 , New York, 1976. Mamoulian, Rouben, "Controlling Color for Dramatic Effect," in The American Cinematographer (Los Angeles), June 1941; reprinted in Richard Koszarski, editor, Hollywood Directors 1914–1940 , New York, 1976. Gitt, Robert, and Richard Dayton, "Restoring Becky Sharp ," in American Cinematographer (Los Angeles), vol. 65, November 1984. The novel Vanity Fair had been filmed twice before, in 1923 and 1932, when director Lowell Sherman began this adaptation for Pioneer Films. When Sherman died not long after filming began in late 1934, Rouben Mamoulian took over and all of Sherman's footage was rejected. In most respects the result is an uninteresting adaptation of Thackeray's novel based around a plodding screenplay and a cast of minor-league stars. Yet the film's place in movie history is assured despite its artistic weaknesses for it was the first feature-length film to be made in full (three-color) Technicolor. Before Becky Sharp , three-color Technicolor had been used only for short films, notably by Disney in the animated Flowers and Trees (1932), and The Three Little Pigs (1933). Disney tried to tie Technicolor in to a three-year exclusive contract when it became clear that the process was commercially viable for animation, but the deal collapsed after only one year. As a result, Pioneer Films could use the process to make La Cucaracha (1934), the first full Technicolor live-action short, that was essentially an extended production test for the new process. The success of that project, which won an Oscar for Best Comedy Short Subject, led directly to the making of Becky Sharp. Despite the extra cost—which is estimated to have added thirty percent to the production costs of films in the 1930s—Technicolor's three-strip system and its later refinements dominated the movie industry until the 1950s. Although the film is dramatically flawed, Mamoulian and cinematographer Ray Rennahan make good use of the three-color process, particularly in set pieces such as the stunning ball sequence. Mamoulian began his career working in theatre, and was aware of the possibilities for using colored lighting to signify changes in mood. For this reason he was uncertain about the suitability of Vanity Fair as a vehicle for color adaptation since the red uniforms of the British soldiers who play a large part in the story tended to appear too aggressive on the relatively crude new color system. Yet despite Mamoulian's doubts, the housebound story of Becky Sharp's self-centred rise through elegant society is well chosen, since the new process needed more light than two-color systems, and was all but unusable outdoors in its early form. Reviewing the film for The Spectator magazine, Graham Greene thought the color in Becky Sharp ideal for the period setting, but wondered unkindly whether Technicolor would be able to pick out the subtleties of "the battered Buick . . . the suit worn too long, the oily hat." It is worth noting that in the late 1940s makers of low-budget film noirs returned to the cheaper black-and-white film stock to explore such grubby realities. 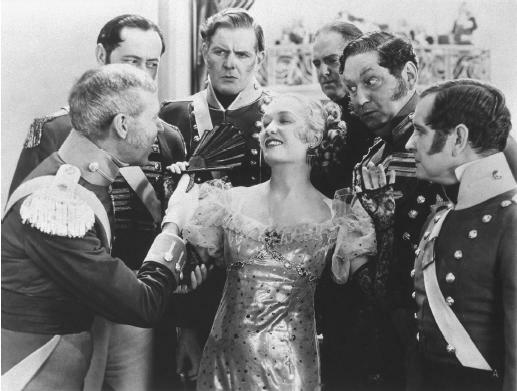 Although Becky Sharp was not a huge commercial success, it made enough money to convince others that the new system was viable despite its extra cost. Mamoulian's "wondrous adventure" of directing Becky Sharp in color was, he thought, as significant a step as the advent of synchronized sound. With other studios using the three-color system the technology improved rapidly. Four years later, Ray Rennahan became a Technicolor pioneer for the second time when he worked on Gone With the Wind with Ernest Haller and the pair won an Oscar for their cinematography. The 1939 film was the first to use Technicolor's new, faster film stock, which halved the required lighting levels. A comparison of the lighting and color definition in Becky Sharp and Gone With the Wind bears this out, making the technical achievement of the earlier film seem even more remarkable. Because of its historical significance, Becky Sharp was restored by the UCLA film archives in 1984, and re-issued in three-color form in 1985. None of the original prints survives, and, as film historian David Cook points out, it is ironic that until the 1985 reissue this landmark of color cinema was available only as a two-color Cinecolor version and a heavily edited black-and-white print.